Fiamma F45 and F65 awnings are suitable for motorhomes and campervans while the Fiamma Caravanstore and new Sunstore awnings can be safely mounted to caravan walls and left in place in transit. 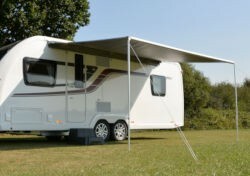 Camperlands also stock a full range of awning fixing kits for Fiamma awnings. The Fiamma Caravanstore is the original bag awning built especially for caravans. The success of the Caravanstore can be attributed to its clever design, which means the Caravanstore itself does not require storage space inside the caravan. Special version of the Fiamma Caravanstore awning canopy fitted with a ZIP system allowing for faster and easier attachment of matching Privacy Room enclosure. The Caravanstore ZIP Canopy is a roll-out awning for Caravans available in lengths from 280 to 550. Fiamma F35 Pro awning with black case and grey canopy available in sizes 250 and 270. The Fiamma F35 Pro awning attaches to a number of popular motorhomes and camper vans thanks to a dedicated series of F35 Pro adapter kits, which are available from Agentfiamma. The F35 PRO is a manually operated awning that is ultra-lightweight and compact, making it ideal for MPV's, 4x4's, Minivans and Camper Vans, such as VW T5, VW T4, Mercedes Viano and vehicles fitted with roof bars. 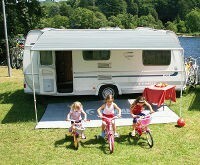 Roll out canopy awning for caravans available in a range of sizes. The Kampa Revo ZIP stores in a bag which can be permanently left on the caravan, and rapidly unfolds to provide a large sun shade awning.